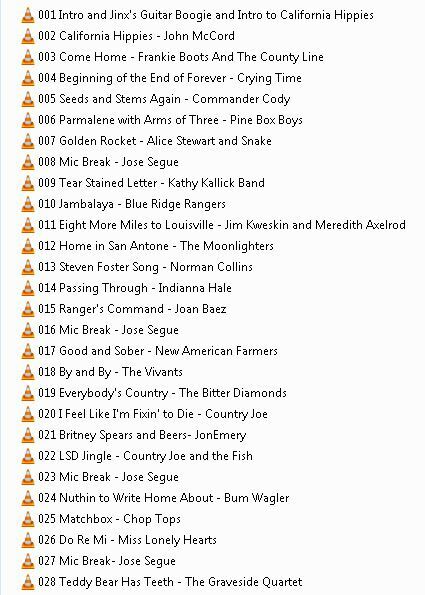 The downloadable track below is the 90-minute Hicks with Sticks broadcast that aired on Fathers’ Day weekend with Jose Segue sitting in for Peter Thompson on KALW’s “Bluegrass Signal.” Most songs are western swing, honky-tonk and alt-country from current Bay Area musicians. Mixed among them, in honor of the Summer of Love, are 50-year-old vinyl selections of hippie country featuring Commander Cody and the Lost Planet Airmen, The Moonlighters (an early Bill Kirchen band), Joan Baez, John Fogarty (solo), Alice Stewart and Snake, and Country Joe and the Fish. The photo above references Hicks with Sticks’ arrival at the newly remodeled KALW studio only to find that the turntable had been removed. Nobody plays vinyl anymore, do they? Yes we do, and thanks to an on-the-fly hook up by KALW’s engineers, we did!